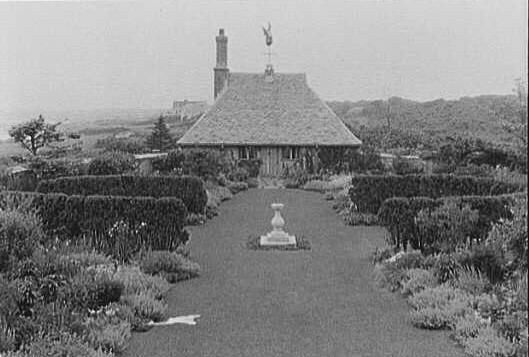 In 1903, Edith Wharton, who had spent summers at Newport since childhood, sold Land's End, the cottage that she had renovated and decorated with the help of Ogden Codman, but had not occupied since 1900. The project had been so successful that the pair collaborated on The Decoration of Houses, which was both Wharton's first book, and which was one of the most influential design tomes of its era, helping to sweep out the gilded excesses of the late 19th century, and bringing to the fore a preference for classical simplicity. 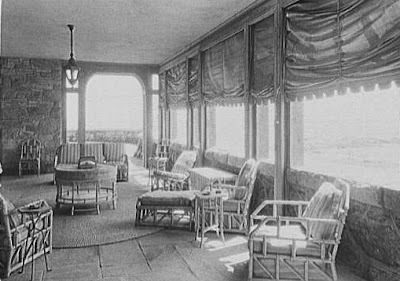 Although Wharton had long had a love-hate affair with the resort, and her reasons for departure were many----the lack of intellectual discourse endemic to places of fashion, and the damp climate among them----I like to think that (and I realize that this is not an officially sanctioned notion, but mere whim on my part) perhaps the last straw was in 1899, when the view from her elegant octagonal sun room was compromised when construction commenced on grim new house across Ledge Road, one whose unknown architect clearly had not yet absorbed Mrs. Wharton's design principles. 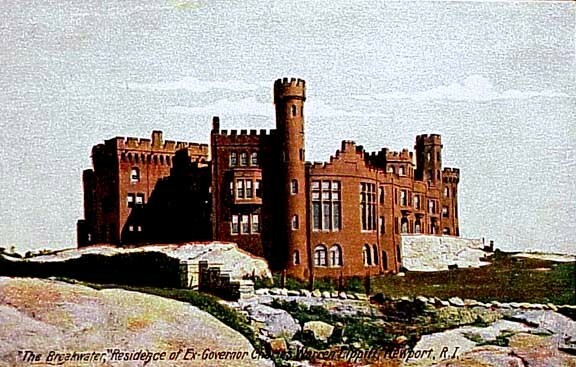 That house, named Breakwater by its owner, Charles Lippitt, son of, and later himself a governor of Rhode Island, was one of Newport's largest cottages, a fair approximation of an English Castle---a little Belvoir, a dash of Windsor, a soupcon of Carnarvon---and the very image of what Wharton's friend Henry James a few years later would so famously refer to as one of the 'white elephants, all house and no garden...witless with no soul', that had risen up to replace the simpler wooden cottages of his own youth in Newport. 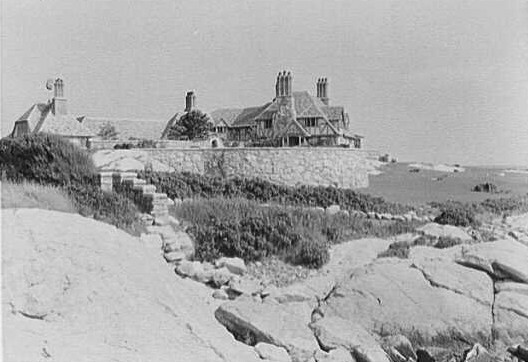 The pile of mortar forbiddingly dominated its spectacular site on rocky ledges at the end of a point between Bellevue Avenue and Bailey's beach. 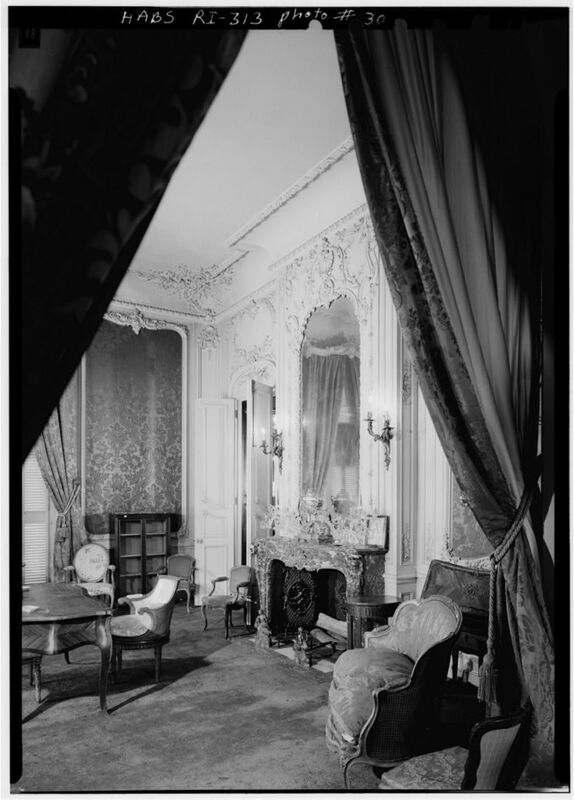 In an 1899 news story, a reporter for the New York Times speculated that Mr. Lippitt's grand structure, then under construction, was to be an apartment house, or first class hotel, so large were the foundations. 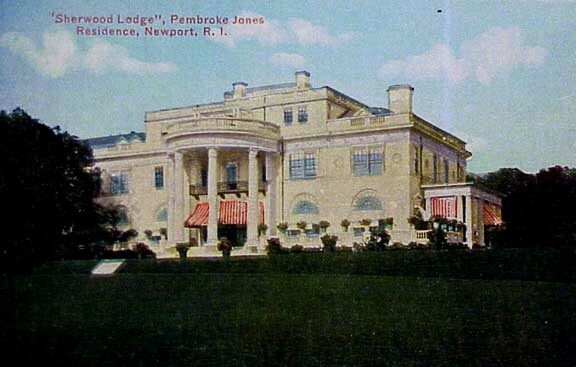 But it was not to be a hotel, much as the reporter felt one was needed in Newport, but merely the Lippitt's summer cottage, three floors of gloom, in sharp contrast to the sparkling marble and gilt palaces around the corner. 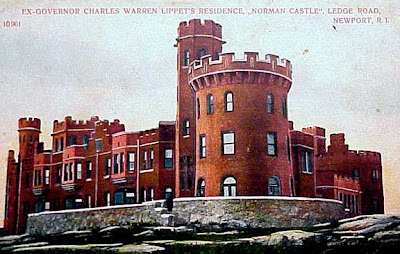 Lippitt died in 1924, and the castle was inherited by his son, who, after considering his options decided to demolish the house. 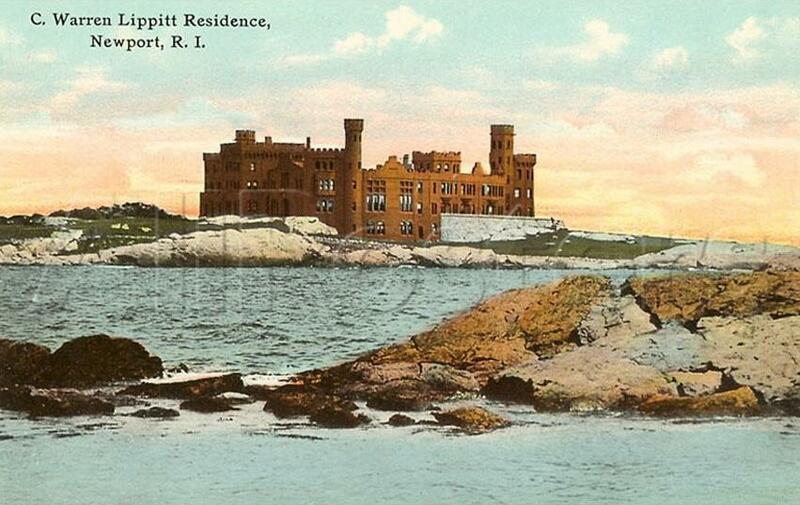 In 1926, the ruins were purchased by architect John Russell Pope, as the site of a new summer home for his family. Pope's had a long relationship with Newport. 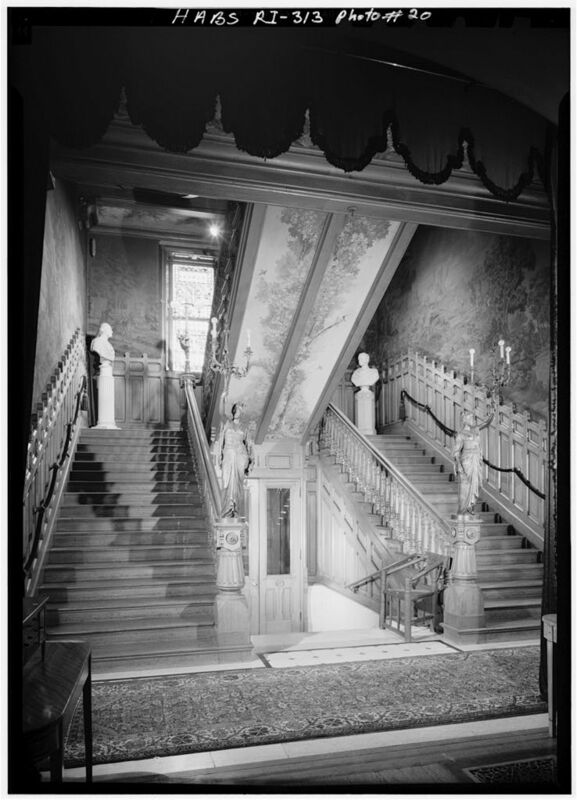 In 1901, he designed Whiteholme, Beaux Arts palace for Mrs. Robert Garrett, later Mrs. Henry Barton Jacobs, widow of the president of the Baltimore and Ohio Railroad. 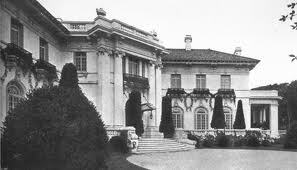 In 1915, Pope completed one of his most famous houses, Bonniecrest in Newport, for Stuart Duncan, the Lea & Perrin's King. 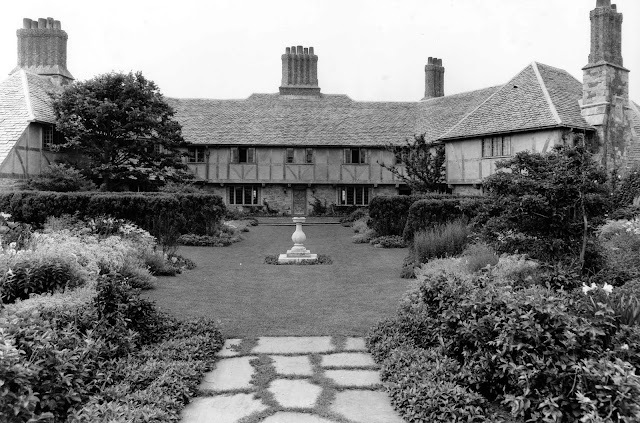 It was a grand and faithful representation of a Tudor country house, based most notably on Compton Wynates. 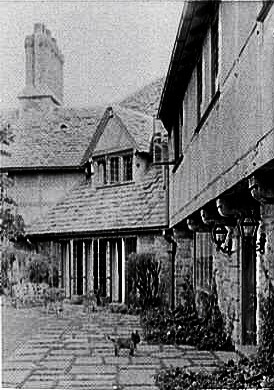 For the design of his own cottage on the Lippitt site in 1927, Pope chose a simpler Olde English idiom, that of a half timber English cottage, albeit on a scale probably never dreamed of by the simple yeomen whose cottages inspired it. 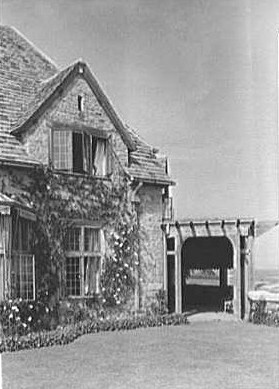 Bonnie Crest, the Stuart Duncan cottage at Newport, by John Russell Pope. 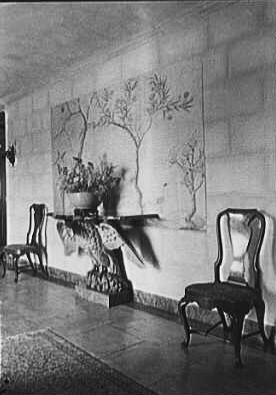 The property immediately to the left was Pen Craig, the home of Edith Wharton's parents. Using the ramparts of the Lippitt Castle as the starting point, Pope built a house, which for all its deliberate aged charm, nevertheless was attuned to its site in a very modern way, seeming to grow out of the very ledges upon which it was built, its weathered natural materials in harmony with the land in a way that the castle had never been. 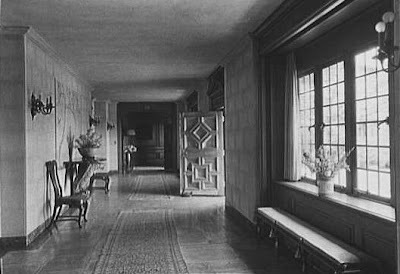 A rambling arc plan allowed every room sun and views, and protected a courtyard garden that evoked the work of Jekyll and Lutyens in England. Taste had indeed changed in the fewer than three decades that separated the buildings. Facing the house across the garden was Pope's studio, where he indulged passions for painting and photography. 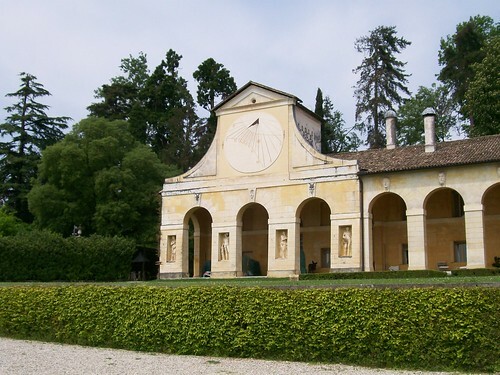 The Popes named their new house The Waves. 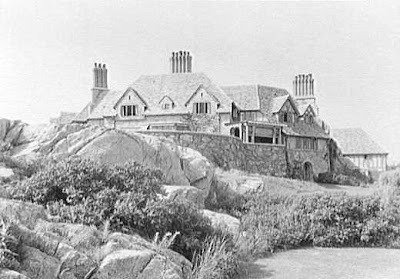 After the Popes, the Waves was owned by Josephine Hartford Bryce, heiress to the A&P Grocery fortune. 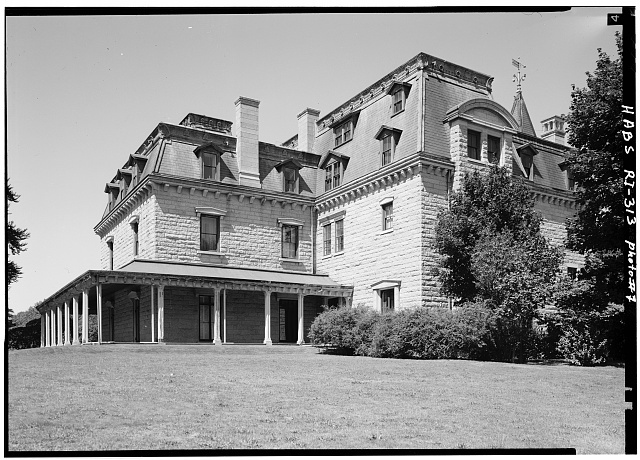 Her daughter, Nuala, married Senator Claiborne Pell, and built a cottage, Pelican Lodge, at the northern end of the property. 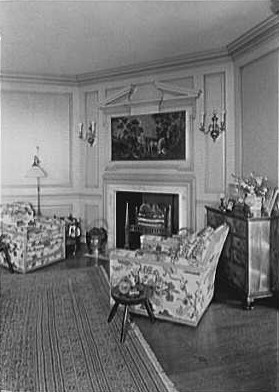 Later, The Waves was purchased by Barclay Warburton, an heir to the Wanamaker's Department Store fortune, who divided it into condominiums, which it remains to this day. 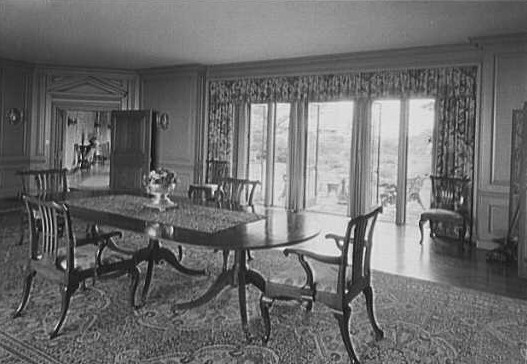 In a 1961 article about the decline of Newport, Time Magazine reported that the dining room alone now held a four room apartment. In my frequent wanderings through the HABS catalog, I have found many such errors, enough sadly, that they make suspect the accuracy and reliability of the catalog as a whole. I confess, as if the regular reader hadn't noticed, a passion for the facts---accurate, hard facts. I enjoy the hunt, separating urban legend from what really happened, reconstructing a scenario from sometimes conflicting accounts, bringing logic to the proceedings. It's why I prefer the New York Times to Fox News, any political leanings aside. When I'm wrong, as I often am (don't tell my friends that I admit it), I am glad of being corrected and set on the path to truth and righteousness. And so it is always disheartening to discover that a major and authoritative source has strayed. 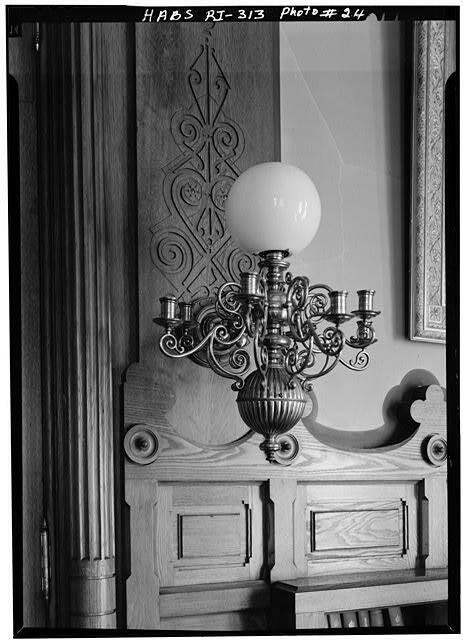 One assumes, of course, that the huge job of scanning and uploading these thousands of images was performed by interns, and in fact hopes, given the evidence, that it wasn't done by Library of Congress staff. Or, in fairness, perhaps the pictures have been mislabeled from the beginning, Either way, most of the errors are easily enough spotted by merely looking at picture and caption and stopping for a moment to assess the information given. Internships are important----they give a student experience in a chosen field, they give needed assistance to organizations and institutions whose resources are stretched. 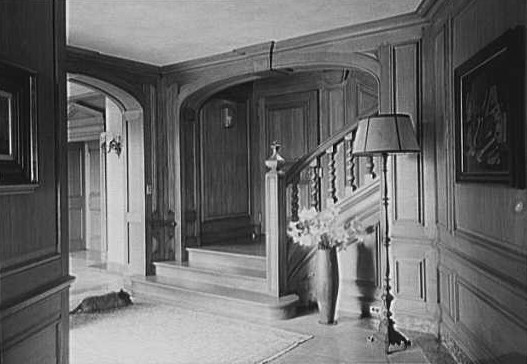 But interns need the ability to think critically, and to ask questions---and staff need to supervise, else you wind up with examples like below, also from HABS, this time of Chateau Sur Mer, the grand Wetmore cottage at Newport designed by Seth Bradford, and variously altered by Richard Morris Hunt, John Russell Pope, and Frederic Rhinelander King. 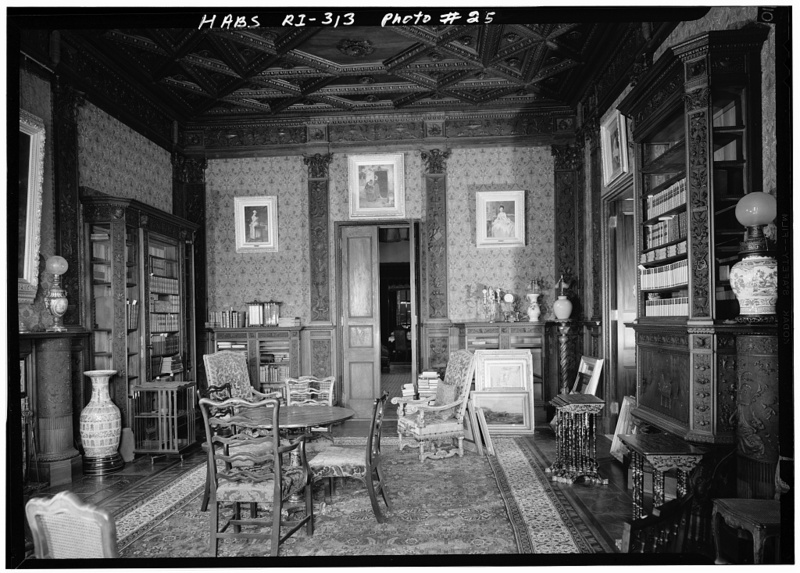 The photo of the library is my particular favorite, because as anyone can seethe desk is open. I'm sure I appear didactic, but it is worrisome that the organizations charged with research and accuracy sometimes fall down beyond the point of acceptable human error. 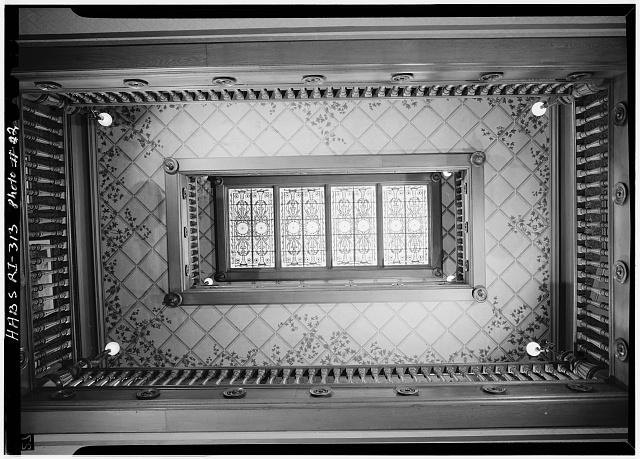 Recently, while seeking material for a recent project, of importance to the money-making career enhancing portion of my life, not merely blogging fun, I wandered to the Bangor Public Library. I needed something very specific from a vintage issue of Country Life in America, and knew that the Bangor Library had a complete run of the magazine. And here's where the trouble began. The Bangor Library, a magnificent structure designed by Peabody & Stearns, expanded a few years ago, more than doubling its faciility with an addition by Robert A.M. Stern Associates. More recently, they purchased another buiding across town for use as a 'last copy' storage center, and moved their bound periodicals there. Inconvenient though it is for the general public---it is not staffed, hence materials have to be requested and brought a few at a time to the main library building, a delay of sometimes days. But at least they are not throwing out the primary materials, as are so many. I went to a reference librarian, who looked up Country Life in her periodicals catalog, and determined that there were no issues in the collection from the 1930s. As they had all dates both before and after, and the library had had a complete run, this seemed unlikely---that they would for some reason dispose of just those years and keep the rest. I gently pushed, and hit a complete stone wall---basically 'catalog says NO'. I went back again a few days later, and this time at least got her to find that the magazine had gone through several subtle name changes, accounting for the different blocks of cataloging. But, the issue I needed still did not appear in her list, and there the request died. A plea to at least check the shelves resulted, surprisingly, in refusal. But never underestimate a Dilettante in need of information. Finding a different person at the reference desk I asked a third time, laying out my case, and he quickly agreed that it was likely there, lost in the cataloging crack, would check himself, and within 48 hours had provided the needed issue. One still can't beat first hand knowledge and engagement in the task. End of rant. In a couple of days, you'll be able to read the post whose research started all this. I used to think, even if not trendy or fashionable myself, that at least I had some bead about what was going on in those worlds. However, I guess not so much, because more and more, things get by me---and how. While stopping for gas at a less-than-upmarket convenience store in a not-so-chic part of rural Maine the other day, I wandered in for a snack, and scanned the displays for my choices. All the usuals were there: Cheetos, salted peanuts, Famous Amos Cookies, Lilly Pulitzer Special Edition Animal Crackers, Snickers Bars, beef jerky----whoa, wait a brightly printed cotton pickin' second! 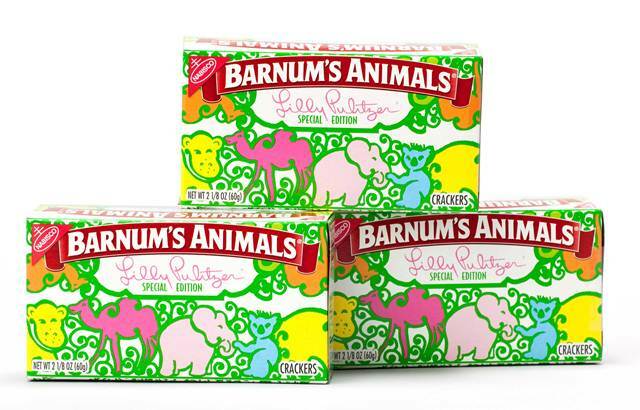 LILLY PULITZER SPECIAL EDITION ANIMAL CRACKERS???? In East Podunk? Anxiously awaited by the mill workers and fishermen stopping by for a six pack and snack on their way home from their very hard, very dirty, work, no doubt? Talk about ironic---I'm still trying to picture it--- "Forget that beef jerky, Mike, I'm gonna have me some of them Lilly Pulitzer Animal Crackers with my Bud tonight!" It turns out, after googling 'Lilly Pulitzer Animal Crackers', that I am indeed the very last person on earth to know, let alone blog, about this, the strangest marketing marriage since Joe Namath donned pantyhose, but that doesn't stop me from duly noting my amusement. One wonders where the nice folk at whatever corporation now owns the Lilly label---I'm not interested enough to Google the answer---thought these 'special edition' crackers were going to wind up? Grocers in Palm Beach and the Hamptons perhaps? Or is this a clever attempt to broaden the brand, and we can soon expect Lilly Pulitzer for K-mart? They've got to do something to replace Martha now that she's gone to Macy's. No, wait, I've got it, Lilly Pulitzer for Carhart safety wear! Lilly Pulitzer steel toed work boots! Already, they are apparently collector's items---I see them on eBay for thrice what I paid (silly reader---you didn't really think I'd just pass them by without buying a couple, did you? ), so maybe I'll just put mine away for retirement. Right next to the Beanie babies. As you see, once again, I'm behind the curve, but if you'll all promise to be kind, I'll tell you about the pair of pink and orange Lilly Men jeans I had back when I was a skinny teenager. On second thought, I've changed my mind. Not on your life. And all the pictures have been destroyed. UPDATE: Color me fuschia pink and lime green with embarrassment. Upon closer inspection, I find that a portion of the proceeds from this special edition go to the Urban Arts Partnership. I can't make fun of that. 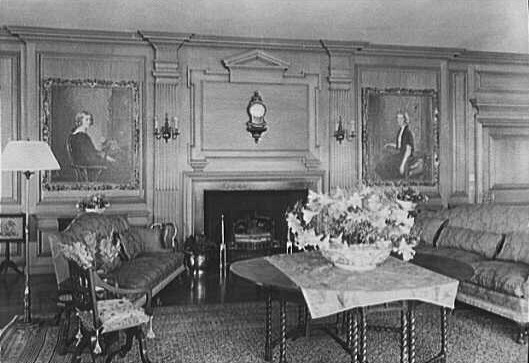 Moving one's house has always been a popular pasttime in New England. 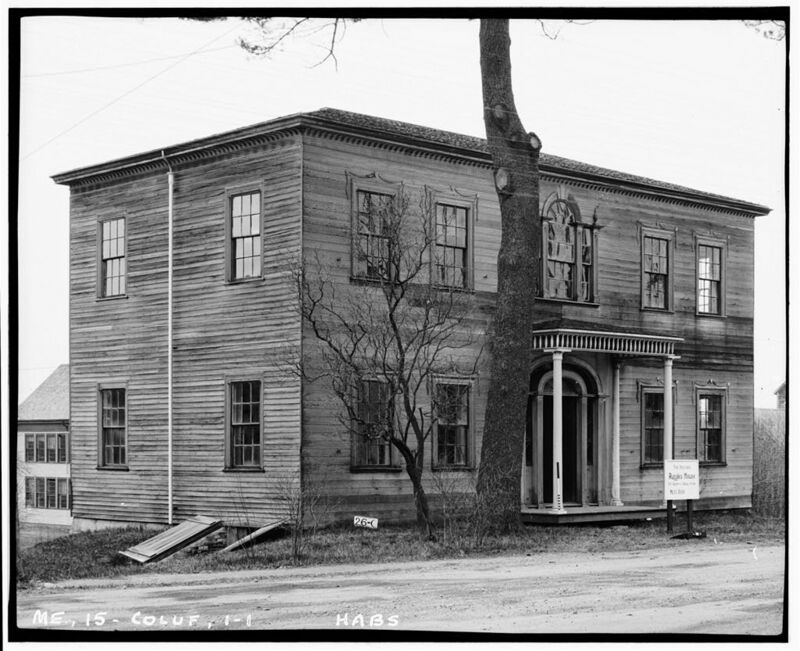 Since the earliest days, buildings have been on the move, by land, by sea, by oxen or truck, whole or in parts. 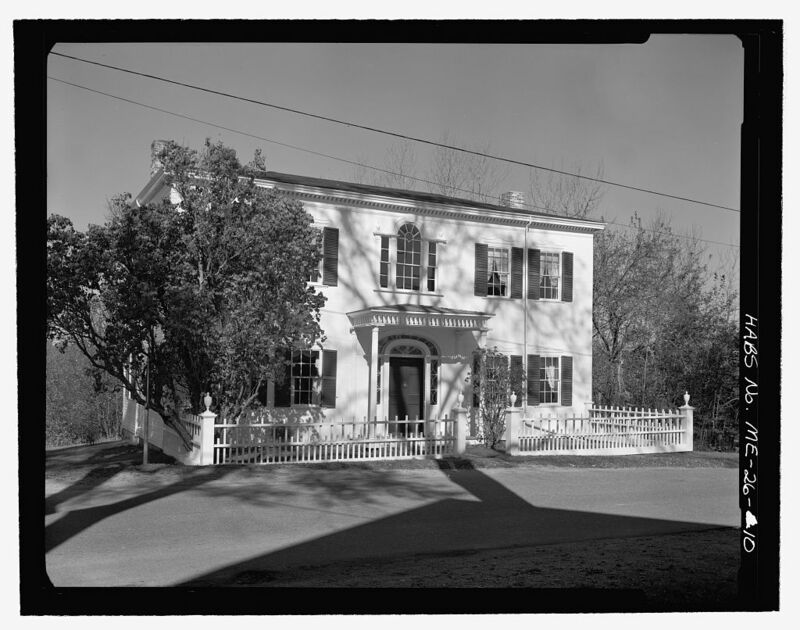 My own house, a cape built in 1814 was replaced when the family who owned it achieved a modest prosperity in the late 19th century and built a new larger house designed by William Ralph Emerson. Rather than demolish the existing house, where the owner's wife had grown up, they lifted it from its foundations, put it on greased logs, and then moved it across fields to its present location. In the neighboring town of Castine, Tory loyalists, not wishing to live in the new United States after the Revolution, took their houses apart, and transported them by boat to Saint Andrews New Brunswick, where they were re-erected, and their owners remained subjects of King George. Elsewhere in our town is a house built in Ellsworth, 15 miles away, in 1796. 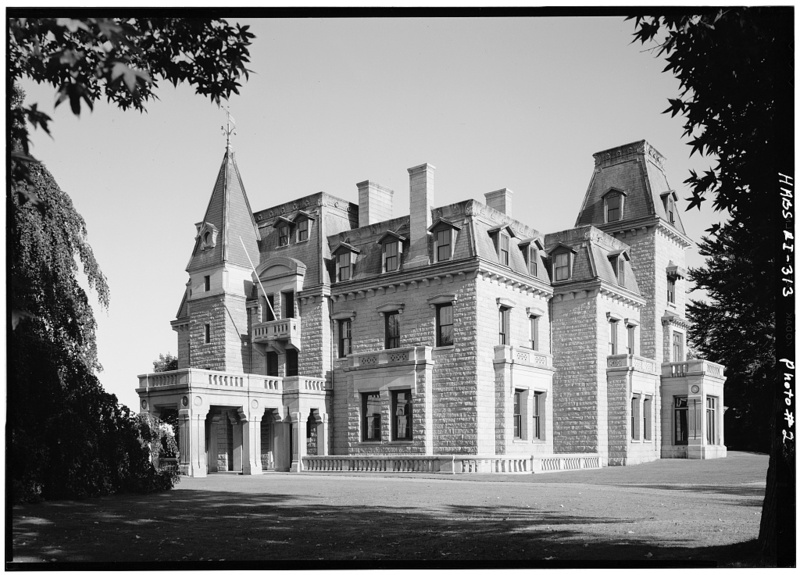 When threatened with demolition, it was purchased by a decorator who borrowed a barge from the St. Regis Paper Company (''fortunately, our family had stock in the company'') and floated it to her parent's summer estate here. And, in a post last year, I told the tale of Spite House, a Federal Mansion that took an 80 mile trip by sea from its original site in Phippsburg Maine (click HERE). After writing last week about "La Rochelle" a grand old summer cottage at Bar Harbor, I was reminded of another traveling house (Click HERE for the previous post). The addition of the Sherley property allowed Mr. Bowdoin's cottage a central location on its property. 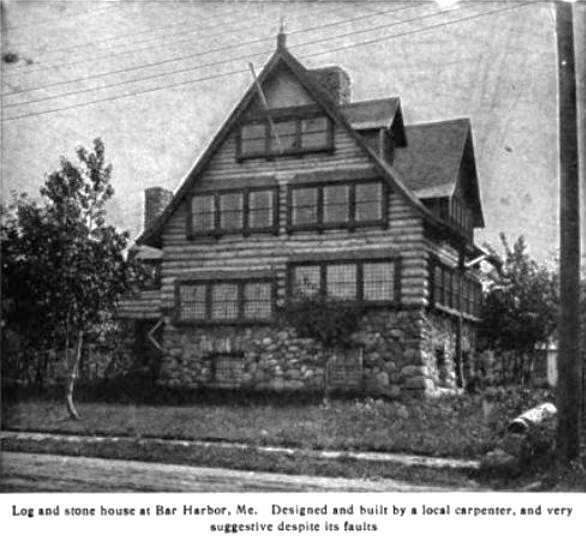 The Sherley cottage was built and designed by a local carpenter to Mr. Sherley's specifications sometime after 1900. 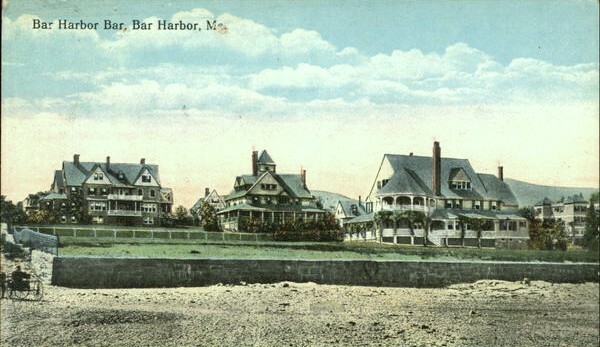 When Mr. Sherley decided to give up Bar Harbor in 1912, he sold the land to his neighbor, Mr. Bowdoin of La Rochelle, who desired a larger lawn. 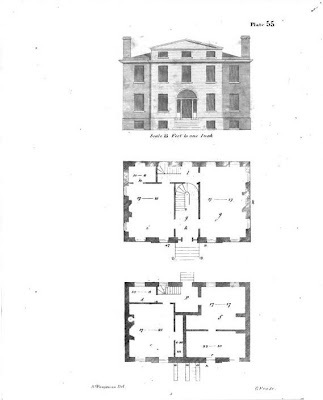 The house, however, wasn't included in the sale. 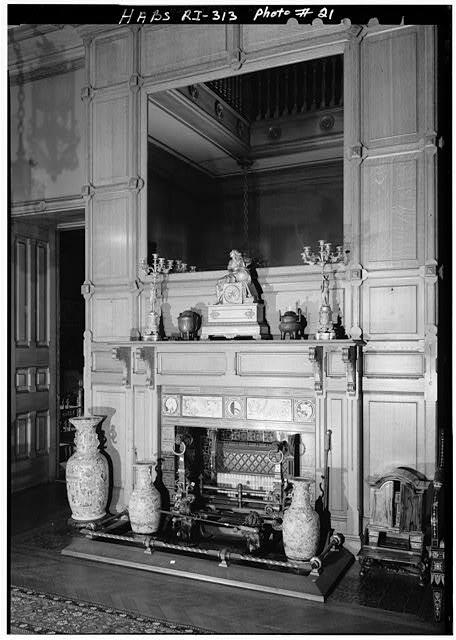 Mr. Sherley instead had the place dismantled, as if it were a giant Lincoln Log kit, and had the whole shipped back to Lexington, where he had it re-erected. And of course, I'd love to know if it still exists. I once saw a picture taken in the 1950's at its later location, but there the trail grows cold. 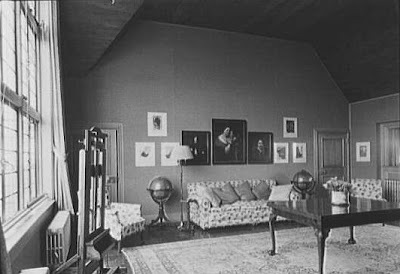 Thanks to the intrepid Flo, yesterday's beautiful mystery house (click here) is a mystery no longer. 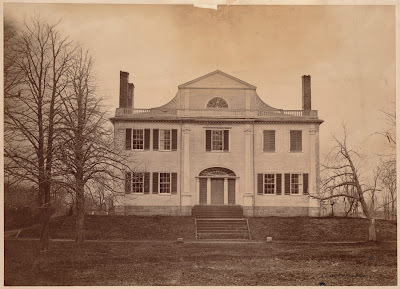 The handsome house was built in Roxbury, near what is now the intersection of Washington St. and Blue Hill Avenue, around 1800 by one Thomas Kilby Jones, a prosperous merchant, as seen in the 19th century engraving below. 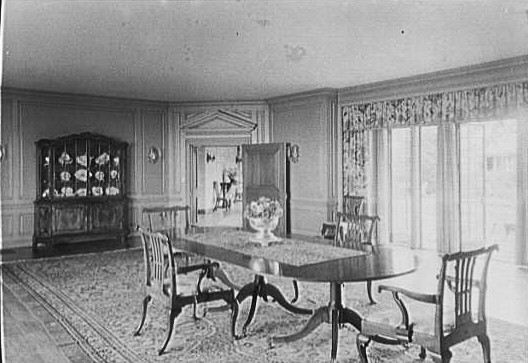 It was demolished in 1898, as the tide of development overtook the neighborhood, which had become 'Grove Hall' which had been the name of the estate. 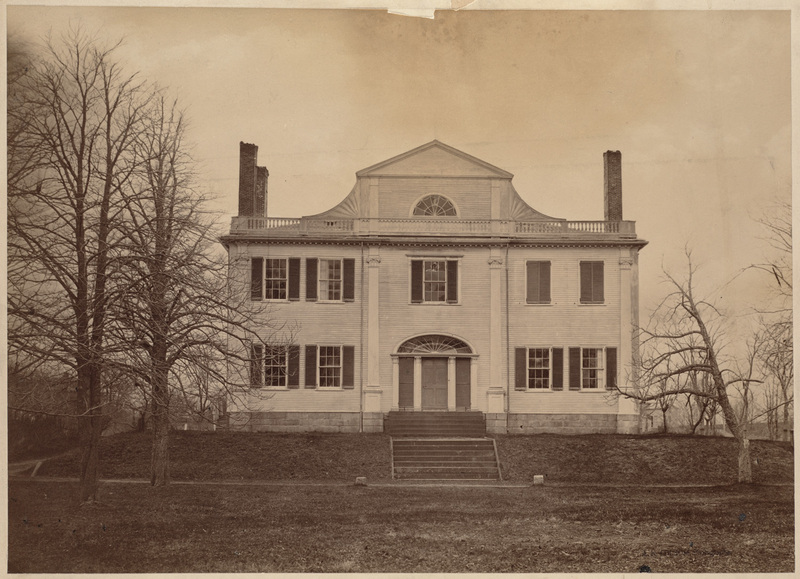 General Dearborn never had anything to do with the house, and it is apparently just one of those labeling errors. Any study of history is a search for the truth, often obscured below many layers of urban legend. "The Grove Hall estate and mansion stood at this crossroads for nearly a century from 1800 to 1898, although it served many different purposes over the years. 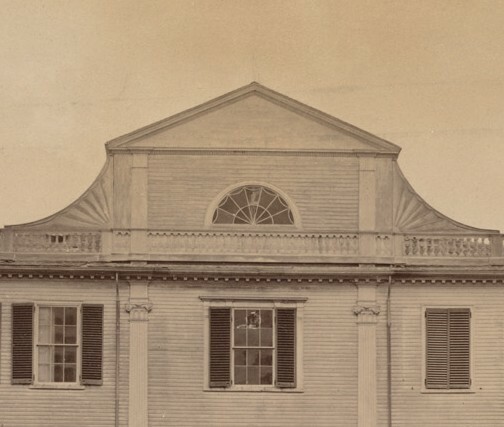 The original owner, Thomas Kilby Jones, was “a prominent merchant and auctioneer of Boston and a gentleman of liberal hospitality.”15 He joined the First Church of Roxbury in 1804 and was a trustee of the Roxbury Latin School.16 In 1832 the original Grove Hall mansion was enlarged and became a hotel and summer boarding house resort. 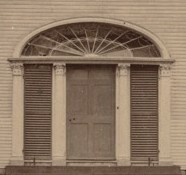 By 1837 it was owned by Edward D. Clarke and managed by C. A. Flagg. 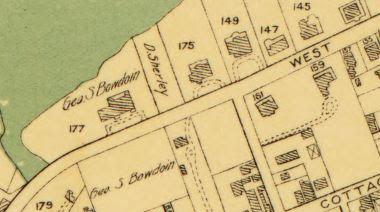 Bowen’s 1838 travel guide describes it as “a delightful resort for private parties, having every accommodation for their recreation and amusement.”17 The estate was converted into the American Orthopedic Institute in the 1840s by Dr. Alanson Abbe. 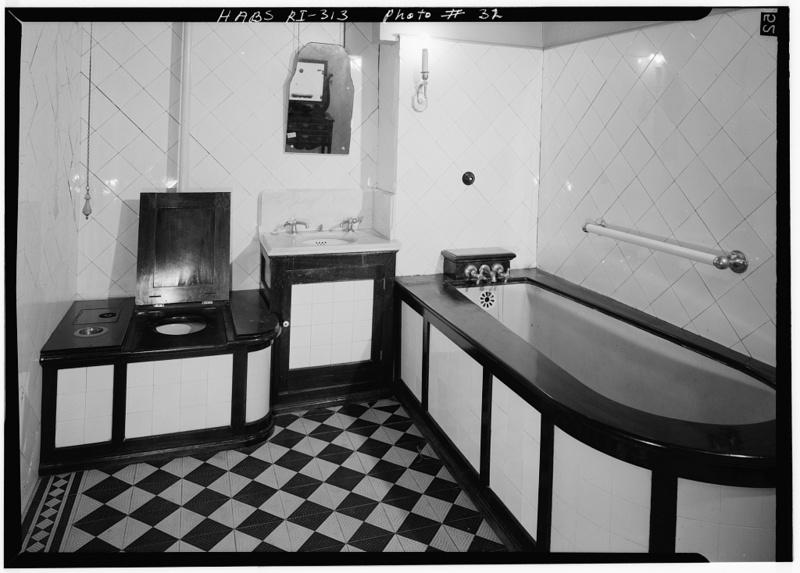 The institute treated various medical conditions (curvature of the spine, paralysis of the limbs, club feet, etc.) 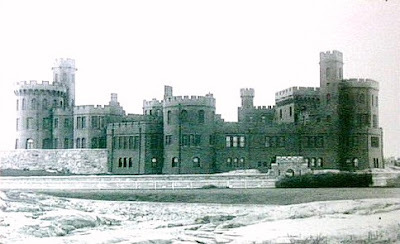 and offered several regular school courses so young people could continue their studies."